Usually I keep this blog away from personal adventures, and stick with the facts and figures of medicine. At times however, I feel that there are certain experiences worth sharing. With it being Australia Day, it seemed even more relevant that I share this experience. I had the great opportunity during last December to participate on-board the STS Young Endeavour from Hobart to Sydney. Before I go any further, I'll tell you a bit about the Young Endeavour. STS Young Endeavour is sail training ship used by the Young Endeavour Youth Scheme for the Youth of Australia. It is operated by the Australian Navy and can include up to 30 youth crew on any single voyage. The aim of the scheme is to build leadership, foster teamwork, develop life-long friendships and create a strong sense of community responsibility. The vessel is brigantine rigged, with a 32-metre (105 ft) tall mainmast, and ten sails with a total area of 511 square metres (5,500 sq ft). Before I got to get under-way on that fantastic voyage, I took some time out to explore some of Tasmania's natural treasures, one of them being the Overland Track. The Overland Track is one of Australia's most well known tracks, running 65kms from Cradle Mountain to Lake St Clair. Along this track you will encounter all types of scenery and terrain; from the rocky sides of mountains to waterfalls surrounded by lush rainforest. I can honestly say I have not been to too many more beautiful or diverse places in the world. The greatest gift I got from the track was its' quietness. I had the opportunity to get away from noise that generally accompanies my day to day life, and allowed it me to reflex on what had occurred throughout the year. Take the time to enjoy the simple things in life and the small pleasures that give you joy, and shed those things which are little more distractions. 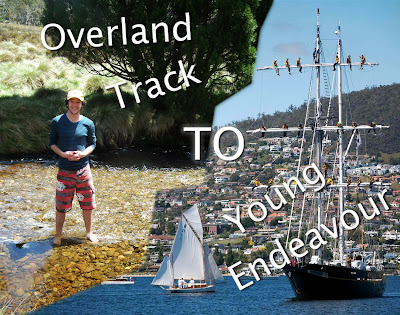 Young Endeavour similarly pushed me to rethink, my attitude towards the world and myself. Each morning we were given many inspirational quotes from the Captain to begin our day. There is one quote for me that really stood out, which we were told right before climbing for our first time to the top of the 32m foremast. Aside from climbing the foremast the Young Endeavour threw many challenges at me personally and the youth crew team, which I could literally spend hours going in to. So rather than doing that I'll just give you a snapshot of some of my highlights. Command Day - Where the Youth Crew take control of Young Endeavour for 24hrs. The Captain kindly reminded before we started that we were responsible for a $22 million ship. Having a fantastic time with a great bunch of people. So why am I mentioning all of this? Well the Ballot is open again for voyages from July to December 2012 and I would like to see as many young Australians as possible have a chance to jump on-board this amazing vessel. If you are a past Youth Crew or Staff member go to youngendeavouraa.org to stay in the loop and participate in future events. That's all from me for now. Hope you had a great Australia Day.